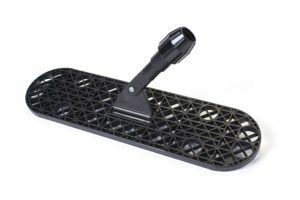 Black 24" Plastic Dust Mop Frame with Low Profile Connector. Rugged all plastic construction - No Metal. Ribbed design keeps mop flat to the floor surface, maximizing dusting ability. Ribbing acts as a beater when shaking the mop. Standard 5" width frame.